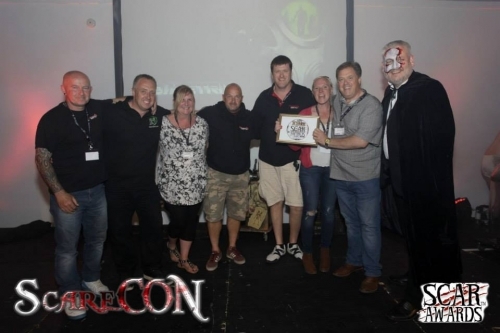 Biometrix, an immersive scare maze entirely designed and built by Fear FX and installed at Broadditch Farm’s Broadwitch Hauntfest in Kent, has won the accolade of Europe’s Best Scare Maze in the 2015 SCAR awards from ScareCON. We developed the back story, designed the maze layout, built and installed all of the special effects and animatronics. Every element was taken into consideration including video and sound effects, atmospheric scents, emergency lighting and exits, disabled access and security and actors. “Hidden behind industrial theming and barbed wire – the maze has a daunting exterior and even the detailed queue line sets up the story of what is about to happen. Whilst queuing, guests are interviewed “live” by a news correspondent which is relayed through the queue, and the whole are creates a terrifying expectation of what is about to happen. Unfortunately NOTHING could have braced us for what did happen! Having done all the other mazes in the park, we thought we knew what Broadwitch’s style of scaring was but for Biometrix all the rules are off! Fear FX, Unit F1-F3 Heath Place, Bognor Regis, West Sussex PO22 9SL .